To bud-graft roses you need a healthy, well-rooted stock plant that will be the base onto which you graft buds from the preferred variety. Most roses you buy at garden centers are grafted. Sometimes you will find a variety that does not bloom as you expected, perhaps due to climate or other growing conditions. If the root stock is healthy, there is no reason to replace it. Instead, use it to graft buds of your favorite rose bush onto it, and create your own new plant. Select a rose bush with strong roots to use as your stock plant. An old rose bush with former grafts that are not productive can be used. Select the new rose you want to graft onto the root stock. Prune back the root stock plant heavily. Early summer when the roses are growing and the sap is flowing in the bushes is the best time to make rose grafts in the home garden. Take a cutting of the new variety you want to graft onto the root stock. Cut a cane that has several new buds forming; these may be at leaf nodes or at swellings along the cane. With a craft knife or razor blade, carefully slice from just above the bud deep into the woody center of the cane, and out again below the bud. The piece should be 1/2 to 3/4 inch long. Use the tip of the blade to pop the woody part away from the back of the bud slice. You will be left with the oozy cambium layer (which carries the water and nutrients) behind the outer stem and bud layer. Use the craft knife or razor blade to make a “T” shaped cut in the rootstock stem where you will place the graft. The top of the “T” should be about 1 inch across, and the vertical line should also be about 1 inch long. This is a VERY shallow cut. You must cut through the skin of the stem only, and do not damage the cambium layer. Carefully peel open the corners of the “T” from the cross point of the cuts. Slip the bud into the slit, bud facing upwards, having the two cambium layers in full contact. Press the peeled corners back up over the bud graft. Wrap the graft slit with grafting tape or ties to hold the cut pieces in place until they take, or grow together. The bud graft should begin to swell and grow in 7 to 10 days, and the wounds should be healed a few days later. Carefully remove the tape after the wound has healed and the bud shoot begins to grow. 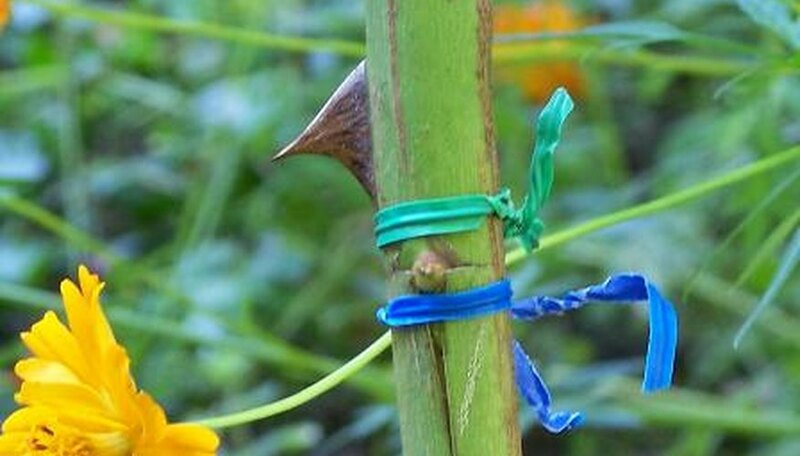 Make practice cuts on pruned rose canes to learn where the cambium layer is and how deep to cut. Prune away grafts of old rose varieties to keep your new rose bush true to your new grafts. Make home garden grafts in the late afternoon or evening. This allows the bud cambium to contact the stock cambium for several hours overnight without harsh drying from sun and heat. It will help establish the union and support the sap flow. Never use a diseased or damaged rose for stock. However, bud grafts are a good way to save a rose that has suffered storm damage or non-disease related injury.